Delaney Monahan is a Project Manager at Davidoff Mission-Driven Business Strategy. She works closely with Davidoff’s senior consultants to design and execute strategic planning, marketing strategy, partnership engagement, and additional projects to support her client’ missions and impact. 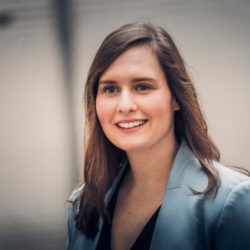 Delaney has contributed her experience to strategic consulting projects with a variety of Davidoff clients including American College of Prosthodontists, Chicago Child Care Society, Chicagoland Lutheran Educational Foundation, and the Christopher Family Foundation. Prior to joining Davidoff, Delaney served as a Research and Member Services Specialist for the Boston College Center for Work and Family. Delaney completed her Master of Social Work with a concentration in Social Innovation and Leadership at Boston College and did her undergraduate studies at The Catholic University of America where she earned a B.A. in Psychology and a B.A. in Theology and Religious Studies. Delaney is newly married and resides on Chicago’s west side with her husband Ryan.